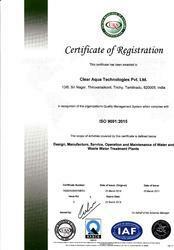 Incepted in the year 2005, "Clear Aqua Technologies P. Ltd." is engaged in Manufacturing, Wholesaling, Retailing, Exporting, Service Providing and offering consultancy for the commissioning of Water Treatment Plants, which address to the urgent requirements of portable drinking water for commercial and industrial use. Our range includes Water Treatment Plants, Water Treatment Chemicals, Water Treatment Plants Consultancy Services, etc. In conformation with BIS and FDA standards, these plants are known for compact design, easy installation and low maintenance. With the assistance of our advanced technology & team of experts, we have designed, manufactured & commissioned more than 5000 packaged drinking water and water treatment plants across india. To serve our clients in the best possible manner, we also provide various services such as operation and maintenance, annual maintenance, up gradation and services of existing plants and water testing services. Under the able guidance of our mentor Mr. K. R. Gajesh, (Having nine years of experience) we are able to deliver consistent results, offer effective client’s servicing and address to their needs in the best possible manner. His sharp business acumen has helped us to expand our business and carve a niche for ourselves in the industry. Wherein we are able to offer quality tested equipment for the manufacturing of mineral water, process water, high purity water, waste water treatment and various other applications. We are amongst the reputed manufacturers and suppliers of water treatment plants that effectively meet the imperative requirements of portable drinking water for commercial as well as industrial needs. Our range comprises Reverse Osmosis Plant, Seawater Desalination Plant, Ultra Violet Purifiers & Sterilizers, Ozone Generators, Demineralization Plant, Ion Exchange, Ultra Filtration System, Water Softening Plant, Packaged Drinking Water Plant, Sewage Treatment Plant, RO Chemicals, Water Treatment Chemicals and Wastewater Treatment Plant. Fabricated using finest grades of stainless steel, these plants are at par with the BIS and FDA standards. Being a quality conscious organization, we pay paramount attention towards rendering quality services to our clients. We are committed to meet customer satisfaction by supplying quality products, ensuring timely delivery and services through continuous improvement of quality management system. To maintain ‘NIL’ customer complaint. To maintain 100% customer satisfaction. We have been able to develop amiable relationships with our customers through integrity, commitment, honesty and transparency in our business dealings. With a view to attain maximum client’s satisfaction, along with quality range of water, effluent & sea water de-salination treatment plants, we also offer round the clock maintenance and servicing of the same. We have been successful in garnering the trust and loyalty of our valuable clients spread across various parts of the country. To make monetary transaction a hassle free activity, we accept easy payment modes such as cash and demand draft from our customers.